The world’s first commercial power plant, the Edison Illuminating Company’s Pearl Street Station in New York, began producing power 130 years ago today—changing the world forever. The Pearl Street Station delivered power to J.P. Morgan, the New York Times, and the New York Stock Exchange. We have a fascinating collection of documents from the time electric light and power became commercially available, including Edison’s experimental notes from two important dates in the history of the plant. 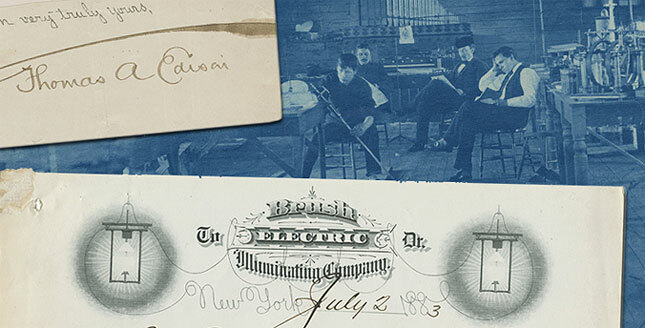 The notes, photographs, clippings and ephemera come from the personal papers of Thomas Edison’s chief engineer, Charles L. Clarke. In addition capturing the first day of power production, the entire archive is a testament to Edison’s genius of blending creative inspiration and production methods. See this fascinating archive on our website.